We present a new algorithm for simulating large-scale crowds at interactive rates based on the Principle of Least Effort (PLE). Our approach uses an optimization method to compute a biomechanically energy-efficient, collision-free trajectory that minimizes the amount of effort for each heterogeneous agent in a large crowd. Moreover, the algorithm can automatically generate many emergent phenomena such as lane formation, crowd compression, edge and wake effects ant others. 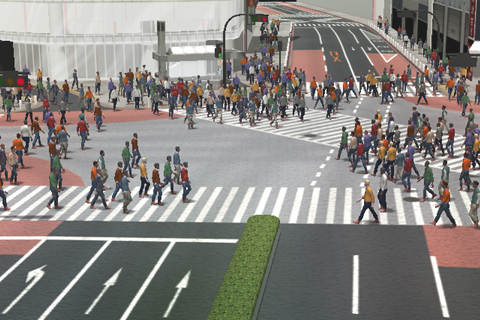 We compare the results from our simulations to data collected from prior studies in pedestrian and crowd dynamics, and provide visual comparisons with real-world video. 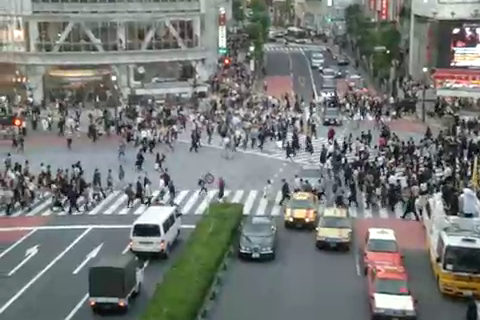 In practice, our approach can interactively simulate large crowds with thousands of agents on a desktop PC and naturally generates a diverse set of emergent behaviors. To appear at the Eurographics/ACM SIGGRAPH Symposium on Computer Animation, Madrid, Spain, 2010.